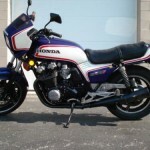 In the early 1980s, this was the ultimate Japanese interpretation of the classic cafe racer: a small bikini fairing strapped in front of a big, air cooled engine. Born out of the CB900F, the 1100 offered the best thinking of the day – namely, more cubic inches, hotter cams, and bigger carbs to build a reported 108 horsepower. The frame was beefed up, and one-piece cast wheels were added to the package. The crew from Cycle magazine even took one out on a 24-hour racetrack excursion to test durability, and ended up with a new record in the process! Part standard, part sport bike and all muscle, the CB1100F was the clear definition of boulevard hot rod during this era. Today we find two very clean examples of this model available for sale – one in each color offered during this model year. Read on for details! 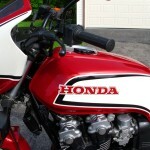 This Red/White 1983 CB1100F sports just over 15,000 miles on the clock – but doesn’t really show its age. This looks to be a well-loved, two owner bike and appears to be completely stock. Those are pretty good credentials for a 28 year old motorcycle, much less a mass-produced model. This condition is what qualifies the bike for posting today, and what makes it desirable. It is a great model and a clear survivor. 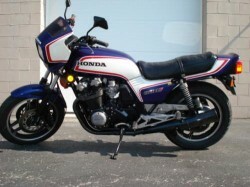 This is a rare showroom quality bike only made in one year, 1983 and was years ahead of design. I purchased this cycle 17 years ago from an older man that never let it see rain, a dirt road or sleep outside and I followed the same pattern. Whenever it was taken out it was handled with care and once back in the garage it got a full cleaning. As far as I can see it is all original and stock. The paint is excellent and has but one rub mark on the fairing (see pic). No dents in the tank and it is free of rust (I tried to show but the pic is weak). The mufflers have no rust through, holes or dents but do have one rub under the left passenger foot peg (see pic). The brake master cylinders were just stripped and cleaned and the 3 brake calipers rebuilt and have new pads. The carbs were pulled and fully cleaned. Headlamp, turn signals, brake lights and cluster lights all work and are powered by a brand new battery. The starter works and the bike starts right away. Chain, sprocket and tires are very good. It runs like a champ, purring at idle and screaming at full throttle. This is one strong fast bike (110 horse power). This is a chance to purchase a very rare bike that you can ride now and not have to replace or repair. 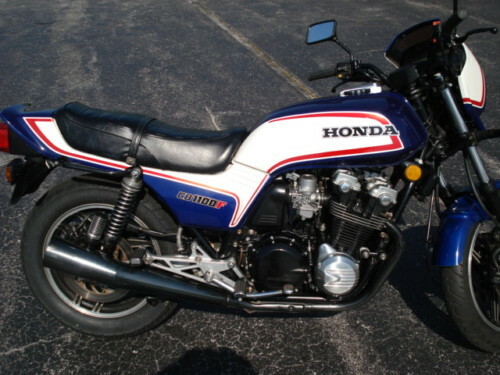 This well-kept example has garnered some interest on eBay: after 8 bids this particular bike is approaching $4k. The reserve is off, so someone will be going home with this bike very soon. Will it be you? – there is one very classic and very pretty bike available now! This Blue/White bike is the same model year as the previous offering, and has only 14,400 miles on the odometer. The condition appears to be very original (again, quite rare for a 28 year old bike), and the blue paint scheme is ever-so-much rarer than the “ride red” color combo on the earlier bike. 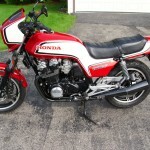 This is a CB1100F which was only made for one year, in 1983. It has a beautiful design that was ahead of it’s time. When you see it, you’ll find the beautiful Blue & White paint is in excellent shape. Only a small few minor scuffs and nicks. 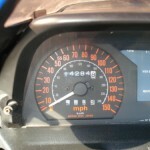 This bike only has 14,300 miles! With such low mileage, you’ll find the motor runs smooth and clean and pulls hard with lots of power. This bike was mostly ridden by mature adults and the previous owner was a collector and fair casual rider. Any items that it needed were always correctly serviced or replaced. Everything is in great shape, and Very original. The Black Chrome exhausts look great with no visable dents or scratches. Everything worlks great too. You’ll only find minimal surface corrosion in a few spots, ( like the center of the rear rotor) but much less than is normal for a bike of this age . Tires, seat, chain, graphics, mechanical, shifting, clutch, etc, everything looks great & works great. 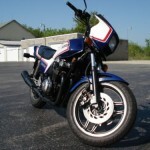 I just changed the oil with the correct Valvoline 20W50 Motorcycle oil and a new Wix filter. Correct new NGK plugs were also gapped and installed, and an excellent motorcycle mechanic cleaned and sync’ed the carbs. 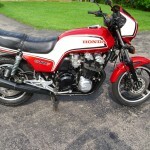 This is a well maintained, sweet and desirable bike that is very collectable and fun to drive. You won’t be disappointed and you’ll have a very cool bike that could appreciate in value. 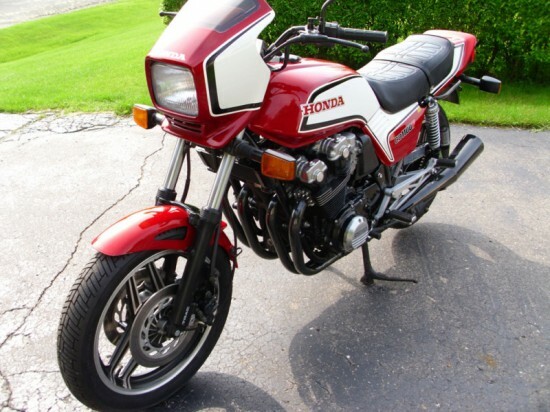 The seller is correct: this is a bike that very well could appreciate in value over time. Fortunately, the market for mass-produced Japanese classics is still quite weak, meaning that collectors looking for a good long-term prospect can snap one of these up on the cheap!
. 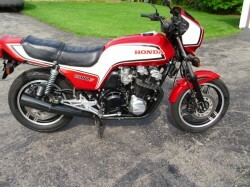 A beautiful CB1100F awaits!